Ever since the original Cadillac CTS debuted more than 10 years ago, Cadillac has had its sights well and truly set on defeating the titanen of luxury – Mercedes, BMW, and Audi. But it hasn't been able to do that without a big flagship. So now Cadillac is going to bring the fight to the mountaintop. General Motors Co.'s top product development executive confirmed Tuesday that the automaker will build a large Cadillac sedan on a new platform. 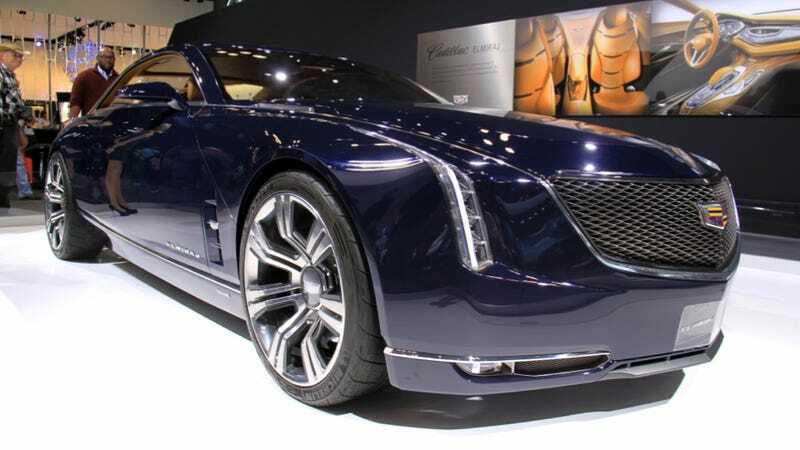 Mark Reuss, GM's head of global product development, purchasing and supply chain, said Cadillac is working on the car that would come out in about a year. Bloomberg and other media outlets recently reported that GM planned to build a top-range, rear-wheel drive Cadillac car that would be available late next year. Yes, we've had the Cadillac XTS for a while now, but the front-wheel-drive big one isn't really a top-of-the-line competitor, and despite its leaps in quality, isn't the car that Cadillac so badly wants. The new car is probably going to look a lot like the Cadillac Elmiraj concept that we saw last year, which was cleverly disguised as a coupe. But if the new American yacht is going to debut next year, you can be pretty damn sure that by 2013, Cadillac already knew what their new car looked like, simply because of how long a development cycle takes. And it didn't hurt when Cadillac walked around talking about how the big coupe was "very doable." While this might not sound like much – "oh great, Cadillac's coming out with another car" – this is a huge, enormous moment for the brand, for a few reasons. First of all, the risk is monumental. Do it right, and you've won thousands of adoring new fans, truly acquired the mantlepiece of American luxury, and you'll have proven to the world that the country that put the man on the moon is still capable of manufacturing the best, most beautiful products in the world. I really don't think I'm exaggerating by saying that for some, it could be considered a point of national pride. But if Cadillac does it wrong, then it could become a laughingstock, setting the brand back years. Remember the Cadillac XLR? Based on the C5 Corvette platform, the XLR couldn't quite compete with Mercedes SL, and Caddy quit production in 2009, at the height of the recession. They haven't attempted another one since. But secondly, if Cadillac does it right, it'll put the company back in a position that frankly, it hasn't seen since people walked on the moon. It could be the number one choice for any American thinking of luxury. And if there's anything an auto writer loves more than failed potential, it's realized potential. Cadillac's done pretty well so far, with the new ATS genuinely being comparable to cars like the BMW 3-series. So the new big sedan will be the measure by which the years-long turnaround has succeeded. Let's just hope they can keep that momentum going.